India is a land of culture and traditions. Teachers Day is also a part of the Independent Indian tradition. India celebrates Teachers day every year on September 5th in mark of respect and privilege to India’s Second President and a very well known philosopher Dr. Sarvepalli RadhaKrishnan. Teachers Day is celebrated to appreciate the great efforts of the the teachers. The day is celebrated as a mark of respect towards the contribution of teachers in support of building the nation by educating children and creating them into talented professionals who can definitely shape the future of their country. On this day, all the teachers across schools are provided with mementos and awards towards their contribution in the education field. Teachers and Students come to schools as usual. There wont be any holiday on teachers day. Senior students take over the responsibility of teachers in teaching to junior classes and allow the teachers to have free time on the day. School wide seminars happen and school managements felicitate and honors the teachers. Students give gifts and greeting cards to their teachers displaying their mark of love and respect towards them. All the classes for that day are replaced by celebrations and fun. School Management and Parents emphasize the importance of a teacher in one’s life to the students. Government of India selects the top best teachers and felicitates them on 5th September, teachers day as mark of respect towards their contribution towards their students education. Teachers across the country are nominated by the respective schools and are selected for a recognition based on their contribution towards education. It is considered a great honor and privilege to be felicitated on this day. Many teachers across the country work really hard to become very good teachers to get this felicitation. As part of displaying love and affection towards the teachers, students wish and greet their teachers. Teachers are given mementos for their contribution. Students get special gift for their teachers as a mark of respect. Students wish their teachers early in morning and also share their thoughts and views on what difference the teacher has made in their personal lives. 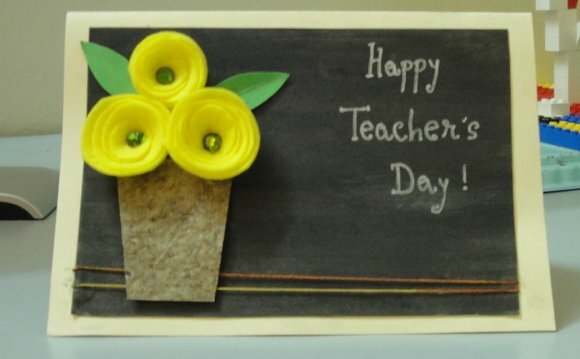 Student in various schools make and share the teachers day greeting cards, teachers day wishes and teachers day messages with the latest teachers day Whatsapp profile pics.